I haven’t travelled a lot in Scandinavia, so was very excited to be spending a few days in Copenhagen before embarking on a cruise of Northern Europe. And I was even more excited to discover that the city’s packed with top-quality restaurants…so many it’s hard to choose where to go. Most famously, there’s Noma, which was voted Number 1 for two years in a row in The San Pellegrino World’s Best Restaurants rating (only losing its top spot this year, it’s now at Number 3). I did try to get a table, but even trying to book early on the day that bookings opened I had no luck. Nothing to get stressed about, as I said there’s no shortage of options – and I was recommended Studio, where I duly booked (three months in advance). 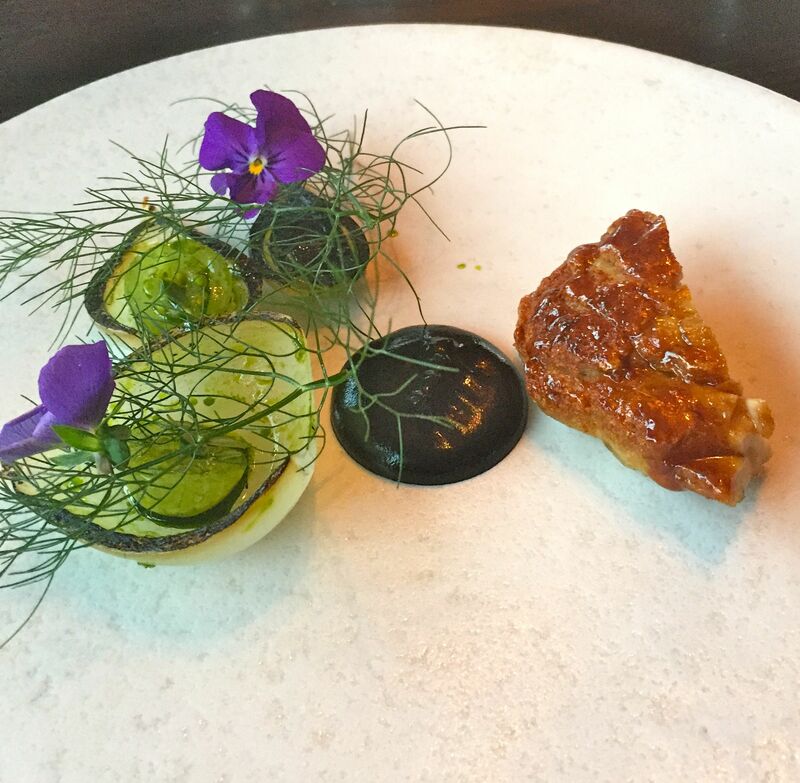 Head chef Torsten Vildegaard was the Deputy Head Chef at Noma for eight years before branching out on his own. 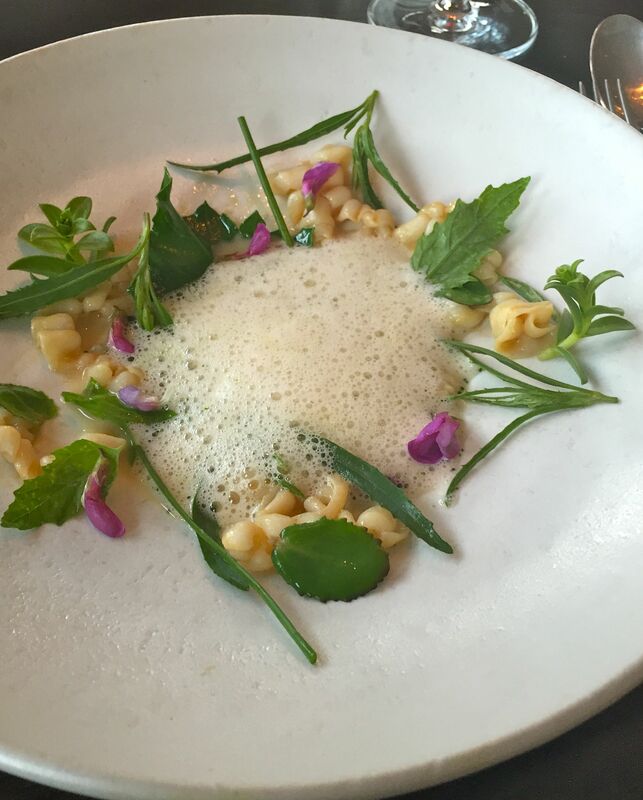 Studio opened in October 2013 and after only four months was awarded a Michelin Star. This year it’s been nominated for all sorts of awards, including the best restaurant in Denmark – now that’s a competition that’s going to be hard to win! 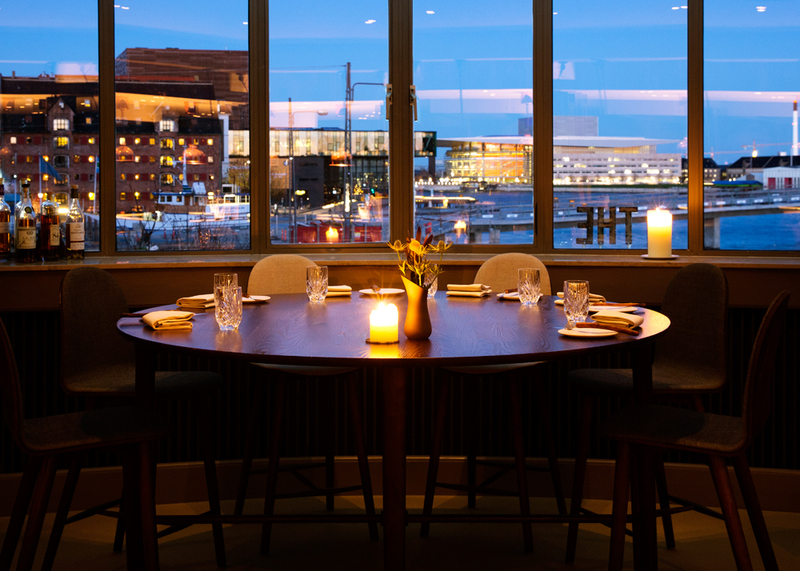 Studio is situated in a lovely spot on the water, the perfect summer dining venue on an amazingly long Copenhagen day – it doesn’t get totally dark until very late, Danish days seem to go on forever. There are two tasting menus available (no a la carte). 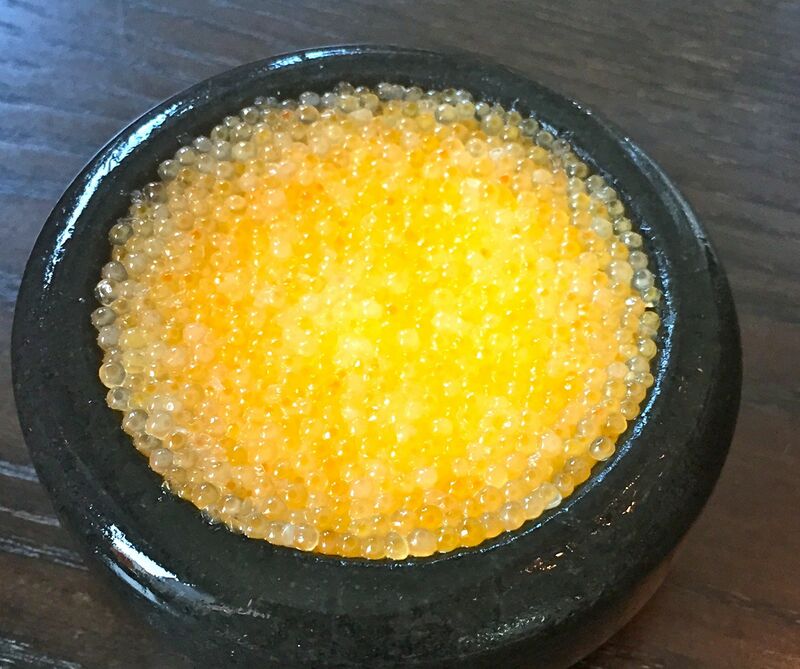 One is seven courses and the other 18 – and the 18-courser includes a range of luxury ingredients like foie gras, caviar and truffles. Sounds intimidating, but portions aren’t huge and some are very light – and all of them were so delicious that it was oh-so-easy to demolish every morsel. 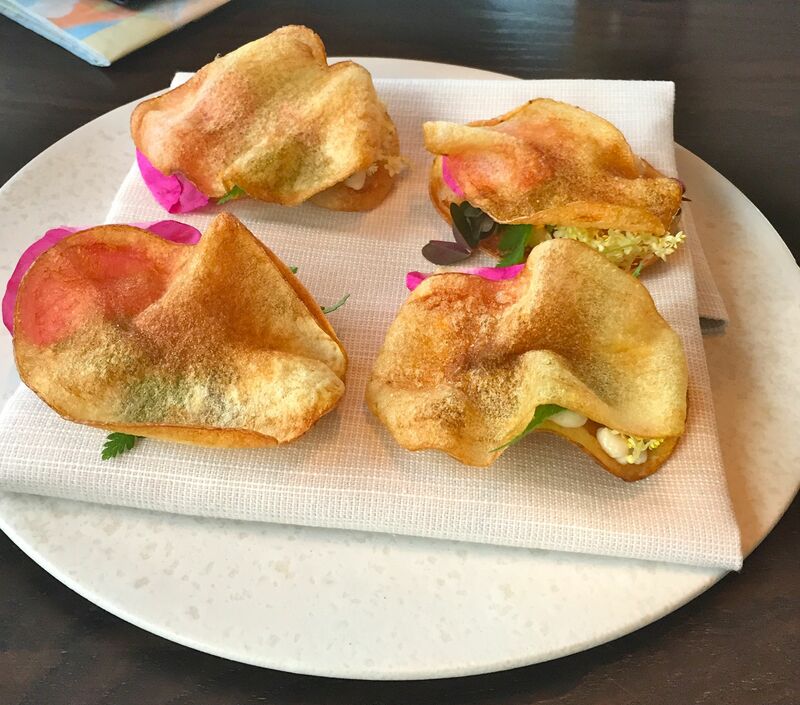 The presentation was to marvel at, the combination of flavours, textures and colours so cleverly conceived of…and the whole experience a total wow. 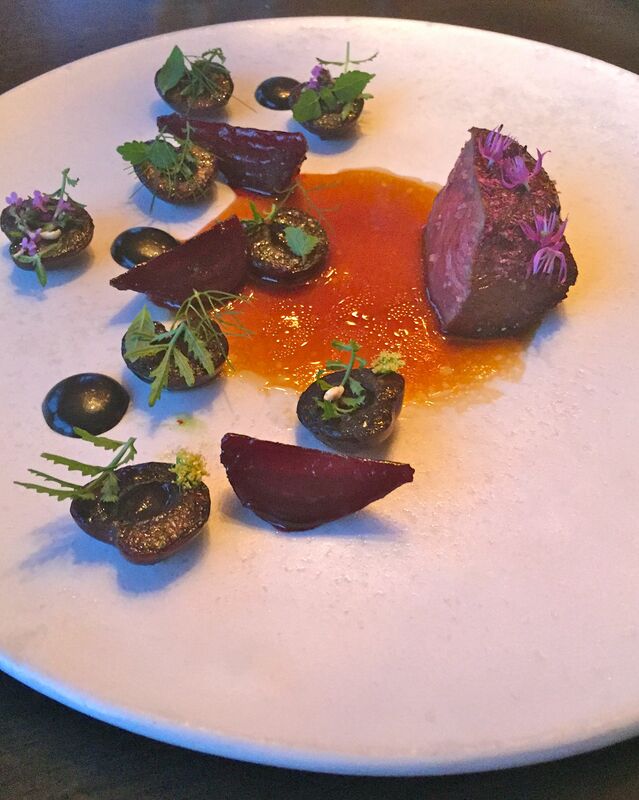 Here are some of the beautiful dishes we delighted in – they’re hard to describe, but you’ll get the idea. Crisps don’t get better than this, well they’re crisp sandwiches, really. Freshly homemade with a delightful fishy filling, they had just the right bite and melted in the mouth after that. 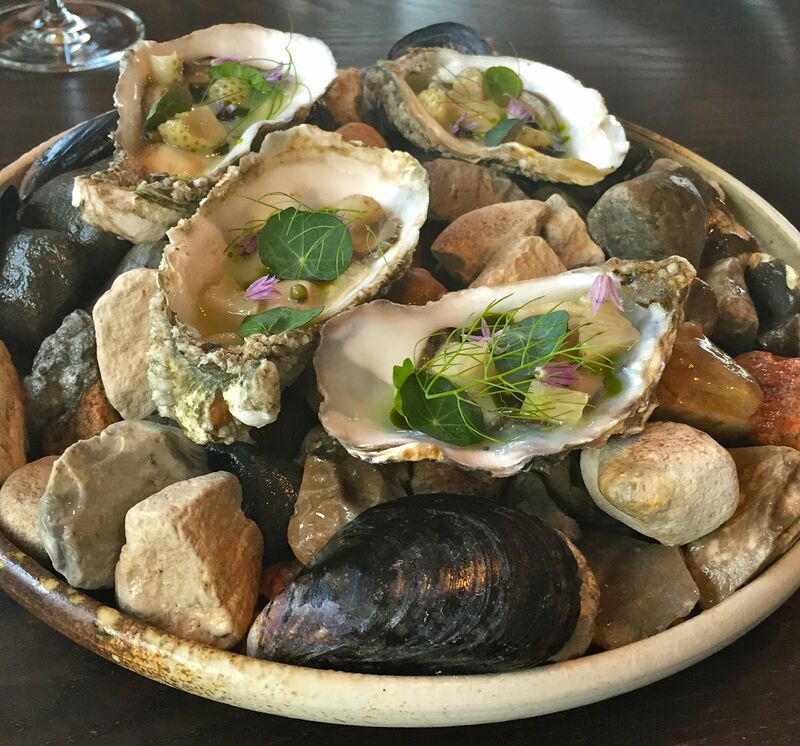 Oysters tasted like they’d come straight from the sea and were served on a base of pebbles and topped with a zingy mix of herbs and green strawberries. 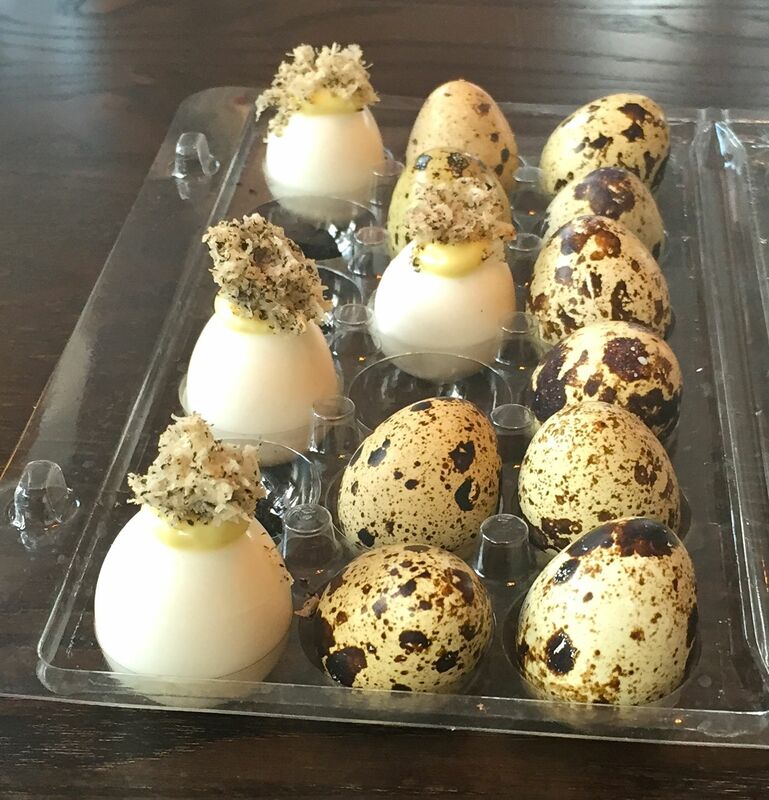 Quails eggs topped with the most delicious of sauces…down in one (don’t want to make a mess after all). And don’t eat the decorations. This could have been my favourite dish of the evening, tender and sweet squid served with local herbs and a light and creamy sauce. Doesn’t it look stunning? How’s this for a work of art? 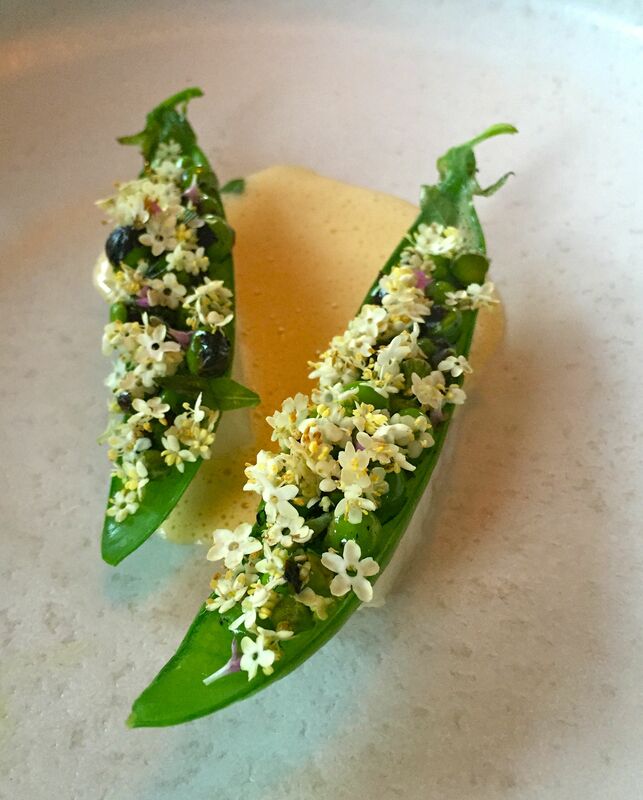 Perfect little portions of sea bass topped with pea-pod boats filled with peas and flowers – it tasted as good as it looked. The prettiest plate of all? Sweetbreads were cooked and sliced at the table, served with a truffly sauce and amazing onion concoction. So rich and indulgent. And then there was the most succulent and flavoursome venison. Pudding time and an ice cream log beautifully decorated to delight in. The final dish was made from a unique Scandinavian brown cheese which, when described to us, really didn’t sound edible at all! Of course it was, not tasting cheesy but sweet and creamy and served nestling in pine leaves. You watch in anticipation as each new dish emerges from the open kitchen. Chefs and waiting staff engage with you at your table explaining how each masterpiece has been created, giving a real intimate feel to proceedings – it seems like it’s all being done just for you. Even Torsten comes out for a chat. You can tell he’s put his heart and soul into Studio, you can taste it in the food and feel it in the air – dinner here is one of those truly memorable experience. It’s an expensive night out, but having said that I think it’s good value for a spectacular package. Ingredients are carefully chosen, largely local (and sometimes unusual) and perfectly prepared. Service is welcoming, friendly and informative and while the food is obviously complicated it doesn’t feel like you’re part of a science experiment. And, most importantly, every dish tasted absolutely wonderful. Our evening ended with a bang when a beautiful firework display erupted over the harbour just as we finished our dinner. I certainly won’t forget that magical Copenhagen night. Studio is at The Standard, 44 Havnegade, Copenhagen. 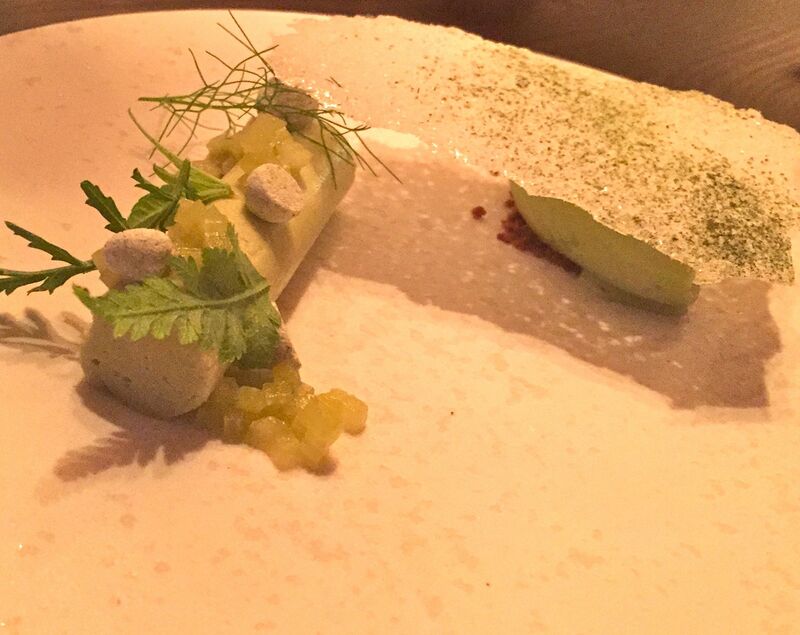 The seven-course menu was 1,000 Danish Krone (about £100). 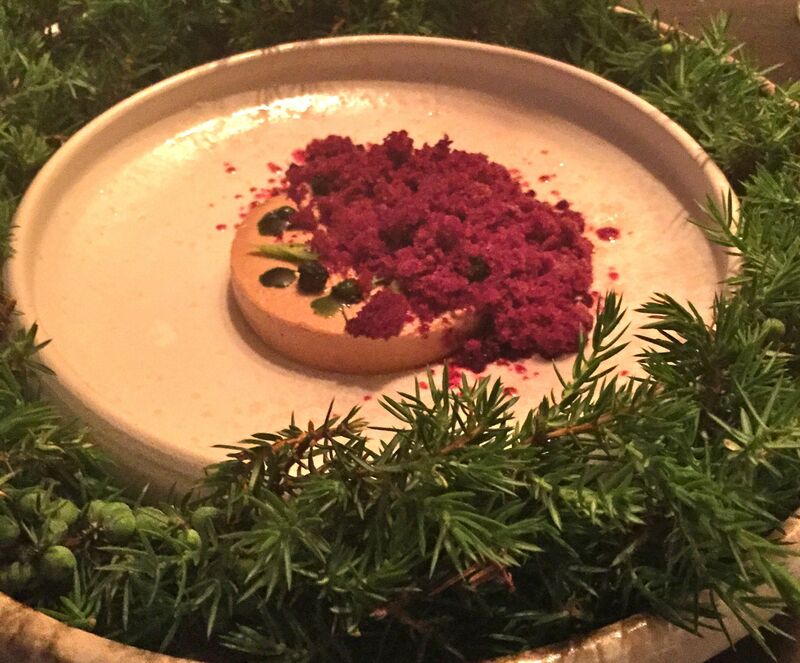 The 18-course menu was 1,500 Danish Krone (about £150).